Week 8 of the NA LCS Spring Split kicks off today! 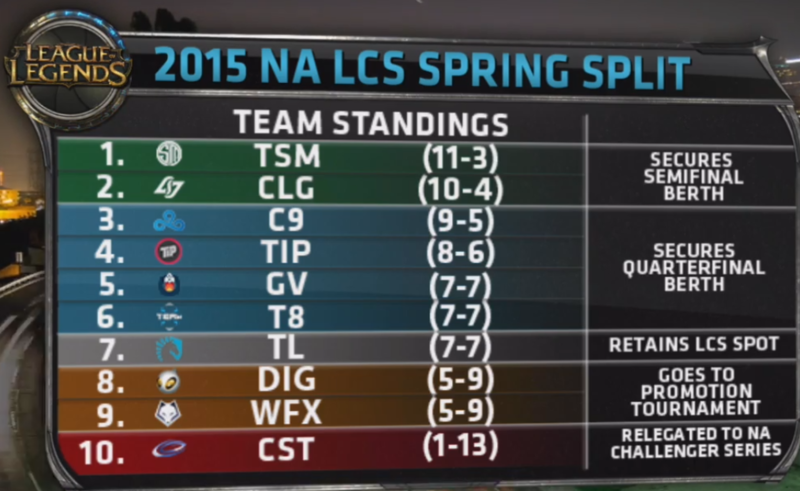 The 2015 NA LCS Spring Split features North America's top ten teams - Cloud9, CLG, Gravity (formerly Curse Academy), Team 8, Team Coast, Dignitas, Team Impulse (formerly LMQ), Team Liquid (formerly Curse), TSM, Winterfox (formerly EG) - playing each other team over the course of the entire split to qualify for Championship Points as well as the mid-season invitational and to avoid being relegated! Keep in mind that the 10th place team will automatically be relegated in the next split while the first place challenger team will be given an LCS position. More details about the changes can be found over on lolesports! LCS Week 8 will be played on patch 5.5 and Bard will NOT BE AVAILABLE for play.